McLaren’s 720S supercar has turned out to be a bit of a heavy hitter, with the car able to keep up and in some cases outmatch pricier, more powerful competition. Now McLaren has added a Spider convertible option to its supercar made by science. It joins the original coupe and Track Package options in showrooms in March 2019, priced from $315,000. 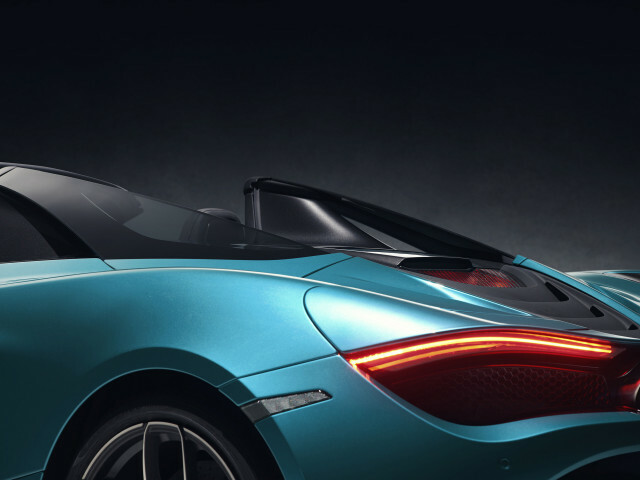 The 720S Spider features a retractable hardtop roof just like its 650S Spider predecessor, effectively making it a coupe when its roof is up. The roof is a one-piece carbon fiber unit that can be lowered or raised in just 11 seconds at speeds of up to 31 mph. Buyers can choose to have an electrochromic glass panel fitted to provide a sense of openness even when the roof is raised. There have been numerous changes implemented to accommodate the retractable hardtop roof, though the weight of the car has only been increased some 108 pounds over the 720S coupe, coming in at a dry figure of 2,937 pounds. Among the changes are new underfloor aerodynamics to work with the new rear bodywork and full-width active rear spoiler of the 720S Spider. The rollover protection technology brings an advantage in respect of size as well as weight, with the compact system allowing McLaren to create incredibly slim tonneau buttresses, which improve over-the-shoulder visibility for the driver. They also allow for unique glazed flying buttresses further aiding driver visibility, not to mention looking downright cool. Naturally, the 720S Spider also features an open-top version of the Monocage II carbon fiber tub found in the 720S coupe. The new upper structure has been engineered to sit as close as possible to the engine’s intercoolers and intake plenum. This maximizes luggage space and results in two cubic feet of storage available under the tonneau cover with the roof raised. The engine is still a 4.0-liter twin-turbocharged V-8 delivering 710 horsepower and 568 pound-feet of torque. Mid-mounted and mated to a 7-speed dual-clutch transmission, the engine will rocket the 720S Spider to 60 mph in 2.8 seconds, past 124 mph in 7.9 seconds, and on to a top speed of 212 mph. Note, the top speed figure is with the roof raised. Lower it, and the top speed is limited to 202 mph. The standing quarter mile sprint meanwhile is dispatched in 10.4 seconds, or only 0.1 seconds slower than the coupe. Finally, the 720S Spider adopts a new 10-spoke pattern for its forged light alloy wheels. They measure 19×9 inches up front and 20×11 inches at the rear. Pirelli P Zero tires are standard and more track-focused P Zero Corsas are offered as a no-cost option. For track fans, a set of Trofeo Rs are also available. The order books for the McLaren 720S Spider are already open.